Trying to trick your cat into taking a pill every day is not for the fainthearted. If you’re able to do it by sticking it down their throat I would probably recommend that method. I hate doing that, I’m terrible at it and my cat hates it too. She doesn’t even like being picked up. I respect her boundaries (even if she doesn’t respect mine) so hiding the pills was the only option. It took us a long time to find this method, we’ve been using it for the last few months and it’s worked without fail. If you want you can skip ahead to “Mincey treat” or you can read through all the other ones we went through first. Cats are obviously all unique, yours may have different tastes so one of the other methods may work better for you. Trying to hide a pill in a bowl of food has never really worked that well, she always finds it and avoids it. Hiding it in something that makes it a treat has worked much better. Please note: the pill my cat has to take each day is meant to be swallowed whole. Crushing pills to hide them in food would open up a lot more concealing opportunities but we couldn’t do that for this medication so all of the methods below involve keeping the pill whole. You need to use a cheese that you can smoosh up and mould around the pill. We used colby because that was what was in the fridge and it worked quite well. She likes cheese so giving it to her like this was ok, it worked for about a week before she got bored and didn’t want them anymore. I bought a precooked deli sausage (in this case a frankfurter), chopped off a small piece, cut a slit in it and hid the pill inside. She liked being given bits of sausage but the pill would often pop out when she was chewing on it so you generally had to do it a few times before she ate it. It didn’t take long for her to get bored of them and it again became unreliable. Similar to the sneaky sausage method in that you generally have to cut a slit into whatever leftover meat you have to hide the pill in. It had more variety than the previous method to help combat her boredom but it wasn’t very successful and meant you always had to save a little bit of your dinner for her, which was tricky if she didn’t like what you made. For this I used a cheese base to coat the pill then squashed little flakes of smoked fish into the outside to try and tempt her. It was moderately successful, she loves fish so if she was really hungry she would go for it and have eaten it before realising there was anything suspicious about it. Again it wasn’t very reliable if she wasn’t particularly hungry and she either became wary of them or bored. It also smelt gross. This was to try and introduce variety as each method had only lasted a maximum of a couple of weeks before she either became suspicious or bored. Most would have a cheese base to stick to which was coated with an outer layer. Sometimes it was crushed up cat treats, ham, leftovers, basically anything I could find that she might be tempted by. At this point I dreaded each morning, I had no idea how long it would take or if it would even work at all, it was a battle of wits and she was winning. This was recommended to me by a deli counter worker I was chatting to at the supermarket, her mother had found great success with it. I started again with a cheese base to coat the pill and then smeared it with some marmite. She absolutely loved it. I really thought this was our saviour but after a couple of weeks she figured out she could lick the marmite off and didn’t have to eat the pill. I was distraught. In desperation one morning I thawed out some raw beef mince from the freezer and tried that. I had to mix it with a little cornflour to get it sticky enough to stay together around the pill but it worked! I checked with my vet about whether it was ok to be giving her raw beef mince, she said it was fine because we had a cat who had been outdoors and caught enough things that she would have the necessary bacteria to be able to process it. But if you have an indoors only cat it might not be a good idea to try it. The vet also said not to use raw chicken because that has much worse bacteria in it, so stick to beef. This method worked well for quite some time but in the end she started to chew them and could feel the pill and would spit it out and just eat the mince. This is the one that’s been the most successful by far, we’ve been using it for a few months and she loves them. It’s a variation of the previous method (make sure you read that one as it has advice from my vet about whether it’s safe to give your cat raw meat). To combat that she could tell the texture of the pill apart from the mince I crushed a dry cat treat and coated it with that. I left it quite chunky so it was harder to tell what was the crushed treat and what was the pill. So to recap it’s raw beef mince mixed with a little cornflour (to make it easy to shape into a meatball and hold together). The pill is hidden inside the meatball, which is coated in a partially crushed dry cat treat. 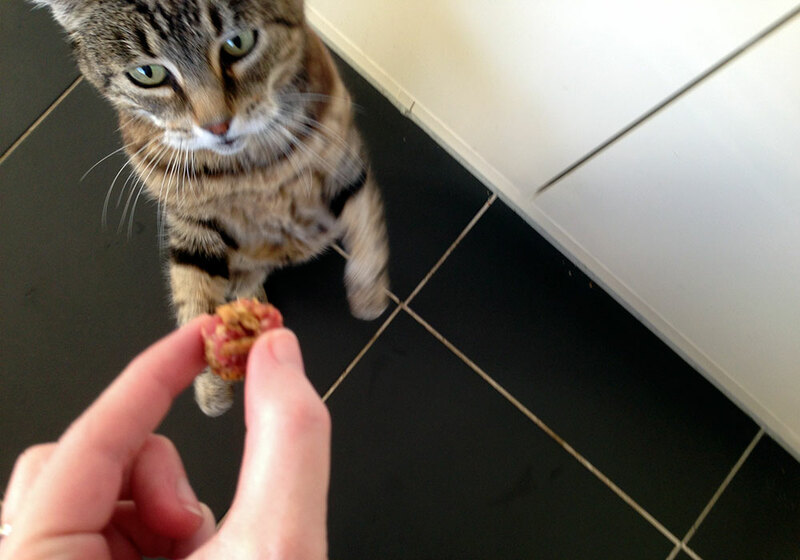 We use Temptations for the cat treat – any flavour seems fine. I know this seems like a lot of work but if you organise things well it’s not too bad. It’s been so reliable and she really loves them so the effort seems worth it to me. You do need to do some meat management to have a constant source or raw mince available. I make lots of small meat balls (each is enough for a few days worth of pills), lay them out in takeaway containers (they need to be separated so they don’t stick together) and put them in the freezer. You take the meatballs out as you need them and put them straight in the fridge to thaw. Thawing in the fridge gives you more time that the meat is still good, if you do it in the microwave or on the bench you’re meant to use it the same day. In the container that has the thawing meatball I also put a spoonful of cornflour. So then each morning you get the container from the fridge, take a small piece of the mince, roll it in the cornflour and shape it into a ball, put the pill inside and then roll that in the crushed cat treat.